You know what it’s like, there is an oil leak under the bonnet, and it is not obvious where it is coming from. You press bits of rag into various crevices in the vain hope that you will change the pattern of the leak to help diagnose the source. Well, I went all through this process and still didn’t find the origin of the leak. What were the symptoms? The nearside of the engine was very wet with oil, as was the bottom of the radiator cowl and the chassis side rail; it was getting quite messy. After a little while, when the car was climbing a long hill in third or second gear, there would suddenly be smoke from under the bonnet, noticeable to the cars behind and very noticeable inside the car. As it seemed to be affecting the bottom of the radiator cowl, my thoughts were lead to believe it was coming from the nose cone area. No! That was not the cause. It appeared to have some symptoms of oil build-up, somewhere, which then ‘overflowed’ onto the exhaust pipe, causing the sudden cloud of smoke. After much head scratching, and consultation with others, I decided to make use of an ‘as new’ petrol pump that I had on the shelf in the workshop. This is when the cure was effected, but I now know the cure but I am still uncertain of the cause. As the ‘new’ petrol pump had been in storage, presumably for many years, I decided to put a new diaphragm into the pump as the one inside it had deteriorated and might not be suitable for modern petrol. 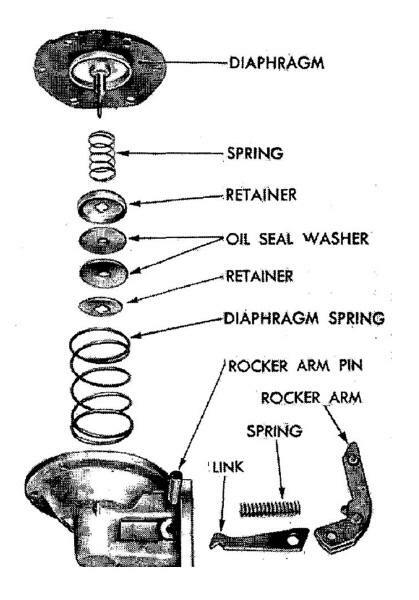 As I took the old diaphragm off the pump it revealed an additional oil seal, held in place with a light spring, which prevented oil getting under the diaphragm. Then I had a ‘eureka’ moment. The lower chamber in the fuel pump has a vent, these either point downwards or, as in this case sideways. It seemed that oil was being compressed as the diaphragm moved downwards and squirted out of the vent which pointed straight at the exhaust! To prove the point, I removed the additional oil seal from the new pump and fitted it to the original oil pump. The end result - leak cured. I can now go up hill for any length of time and not drive in a fog. Brilliant! I suppose the rational of all this is that the additional oil seal was a later modification and it can be easily added to existing older fuel pumps to overcome oil loss out of the breathers in the base of the fuel pump. Maybe that the oil on your engine, under the fuel pump, is not coming from the spindle, or the gasket, as we have all thought in the past but from the breathers. The modification consists of a light spring, two washers with a slotted hole to fit over the flat blade on the diaphragm shaft and a rubber disc which fits the aperture in the casting of the pump. I have tried to show this in the attached diagram. In all time several of us have been playing with Austin Sevens, and in particular the fuel pump, we have never seen the additional oil seal although searching on the internet has revealed that there is a second method of achieving the same thing; that is simply by a rubber disc oil seal with a hole in the centre which is threaded over the diaphragm spindle and then located into the bottom of the pump housing. This is then held in place by a metal ring which is a press fit into the housing. I haven’t checked anywhere to see if the relevant parts are available as spares for the AC pump but it is such a simple arrangement it should not be too difficult to fabricate one. This article, written by Malcolm Watts, originally appeared in CA7C Seven Focus in May 2014 pp20-21.